Pistyll Rhaeadr Waterfalls01691 780392work Waterfall or GorgePistyll Rhaeadr is often referred to as one of the Seven Wonders of Wales. 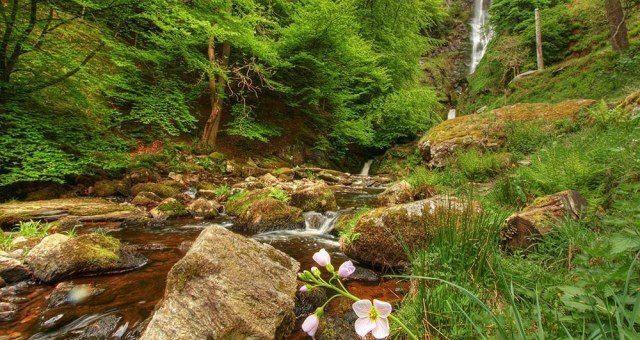 The waterfall is formed by the Afon Disgynfa falling in three stages over a 240-foot cliff-face, into the Afon Rhaeadr below. The tallest stage is estimated at about 40 metres. For visitors, there is a small car park at the foot of the waterfall as well as a small café and it is a great place to explore the Berwyn Mountains (Berwyn comes from the Old Welsh ”bre”(hill) and ”gwyn”(shining white) and surrounding hills, with many walks on all levels to suit a variety of walkers. A 3-mile circuit crosses the foot of the fall and returns to the car park via old quarry heaps and hillsides. A much more adventurous alternative climbs steeply on the right of the waterfall and continues uphill, as far as you want to go along the great cliffs of the Berwyn ridge. Above the waterfall is a lake called Llyn Luncaws. The story goes that in this lake lived a serpent with wings who, once every few days, would fly down the valley to the village and there seize children, women or animals, taking them back to the lake to devour them. Tan-y-Pistyll – meaning little house under the waterfall is where the tea room is located, here we can supply a welcome cup of tea, snack or meal with a lovely view of the waterfall from the outside garden seating, or when its colder a warm log fire to sit by. Pistyll Rhaeadr is often referred to as one of the Seven Wonders of Wales. The waterfall is formed by the Afon Disgynfa falling in three stages over a 240-foot cliff-face, into the Afon Rhaeadr below. The tallest stage is estimated at about 40 metres. The 19th century author George Borrow, in his book Wild Wales, remarked of the waterfall: "What shall I liken it to? I scarcely know, unless it is to an immense skein of silk agitated and disturbed by tempestuous blasts, or to the long tail of a grey courser at furious speed. 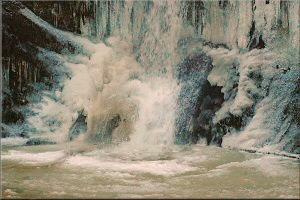 I never saw water falling so gracefully, so much like thin, beautiful threads as here." Local Legend - Gwybr of Llanrhaeadr. Travelling north on the A5 west of Telford. Turn left onto B4396 at Nesscliffe, and then go through Knockin. At the junction of main A483 road from Welshpool to Oswestry, cross-straight over (staggered junction) at the White Lion pub at Llynclys. Continue on the B4396 into Llanrhaeadr-ym-Mochnant (approx. 25 minutes). Travelling south on the A5. Turn off the A5 at Oswestry by-pass onto the A483, signposted Welshpool. After 3 miles, south of Oswestry, turn right at Llyclys crossroads - the White Lion pub is on your right. Continue on the B4396 into Llanrhaeadr (approx. 25 mins). In Llanrhaeadr, drive through the main square past the Wynstay Arms, and turn right into Waterfall Street just before Greatorex, the corner shop. The waterfall is signposted above the shop. Continue along Waterfall Street for four miles until the road ends at the waterfall.